"MANHATTAN." - No Pins. Made for: Manhattan. (121.8). "MANHATTAN." - Left Pin. Made for: Manhattan. (122.0). "MARYLAND CENTRAL R.R." - No Pins. Made for: Maryland Central. (123.0). "MEDICO=CHIRUROICAL COLLEGE." - No Pins. Made for: Medico Chiruroical College. (124.3). "W.L.MELLON PIPE LINE CO." - No Pins. "William Larimar Mellon" co-founder of Gulf Oil Co. Made for: W. L. Mellon Pipe Line Co. (124.4). "SHIP FROM THE EAST VIA MORGAN LINE TIME AND MONEY SAVED" - No Pins - Design 2 - Paperweight. Nickel plated finish. (139.6). "M.&N.W. R.R.Co." - No Pins. Made for: Manchester & North Weare or Manistique & North Western or Manitoba & North Western or Midland & North Western or Minneapolis & North Western or Minnesota & North Western or Minnesota & North Western or Minnesota & North Wisconsin or Mobile & North Western. "MO-KAN 6-LEVER" - No Pins. Made for: Missouri Kansas. (136.0). "MO.PAC.RY. MEN TOILETLOCK" - No Pins. Made for: Missouri Pacific. (137.0). "MO.PAC.RY. WOMEN TOILETLOCK" - No Pins. Made for: Missouri Pacific. (138.0). 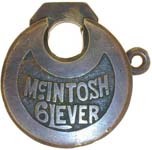 "MORLEY 6-LEVER" - No Pins - High Shackle. Made for: Morley Brothers Hardware Co. (140.1). "MORLEY 6-LEVER" - 2 Pins - Narrow Letters. Made for: Morley Brothers Hardware Co. (140.1.1). "MORLEY 6-LEVER" - 2 Pins - Wide Letters - Low Rounded Shackle. 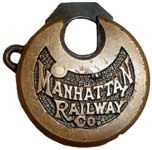 It is not clear if this is a factory low rounded shackle, or altered after manufacture. Made for: Morley Brothers Hardware Co. (140.5).